Arthritis is painful inflammation and stiffness of the joints. A number of factors cause arthritis, including injury, age, obesity, excessive “wear and tear”, and infection. There is more than one type of arthritis. In fact, there are more than 100 types of arthritis. However, there are two major types of arthritis — osteoarthritis, which is the “wear and tear” form of arthritis, and rheumatoid arthritis, an inflammatory type of arthritis that occurs when the body’s immune system is not working properly. Gout, which is caused by crystals that collect in the joints, is another common type of arthritis. Psoriatic arthritis, lupus, septic arthritis, ankylosing spondylitis (inflammation and fusing of the spinal joints), and spondyloarthropathy (joint disease of the vertebral column), are other types. Depending on the type of arthritis involved, a diagnosis may be established through lab tests of the blood, urine or joint fluid; via imaging techniques such as X-ray, CT, MRI, or ultrasound; or through arthroscopic surgery. In order to understand how arthritis impacts the joints, first one must have an understanding of the anatomy of the joints. Cartilage is the slippery covering located on the ends of the bones where one bone meets (or articulates) with another bone. This flexible, connective tissue this provides a bit of cushioning for the bone surfaces at the points of contact, absorbing the pressure and shock created from movement like running and walking. Cartilage also protects the joints and allows for smooth movement. The joint itself is enclosed by the joint capsule. A membrane called the synovium lines the joint capsule. The synovium secretes synovial fluid to lubricate the joint and to provide nourishment for the cartilage in the joint. Osteoarthritis is caused by normal wear and tear throughout one’s life, which causes a reduction in the normal amount of this cartilage tissue. This causes the surfaces of the bones within the joint to grind together, which causes irritation, swelling and pain. The natural breakdown of cartilage tissue may be exacerbated by an infection or acute injury to the joints. The other common form of arthritis, rheumatoid arthritis, occurs when the body’s immune system attacks the tissues of the body. This condition is also referred to as an autoimmune disease. These attacks specifically affect the above-referenced synovium, resulting in swelling in the tissues surrounding the joint. As the swelling exerts pressure on a joint, the joint may become enlarged or even deformed. Rheumatoid arthritis may eventually damage and/or destroy both bone and cartilage inside the joint and some of the tissues in or near the joints. RA typically impacts the smaller joints in the hands and feet. Other forms of inflammatory arthritis can affect and damage the larger joints in the body, such as the hips, knees, elbows, shoulders, and others. 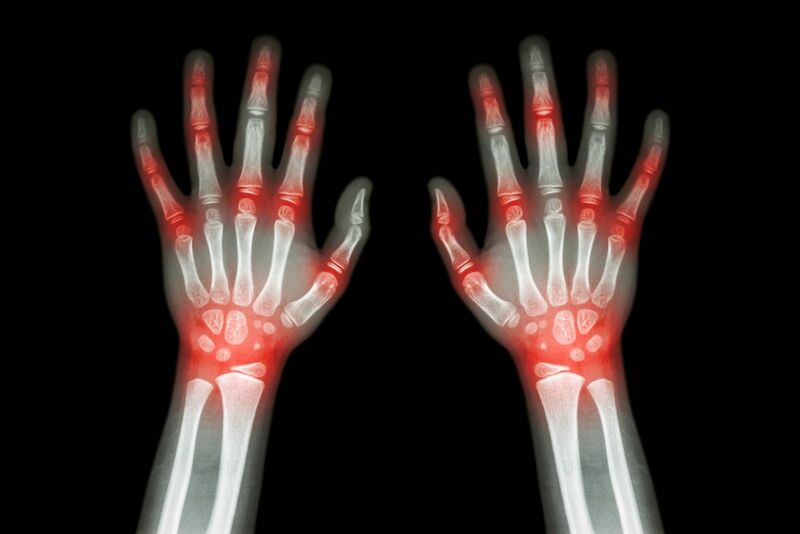 The exact reason why the immune system attacks has not yet been discovered, but scientists have discovered genetic markers that increase one’s risk of developing rheumatoid arthritis. Treatment for arthritis varies, depending on the type. Exercise and/or physical therapy may help to strengthen the muscles surrounding and supporting the affected joints for some patients. For inflammatory arthritis, pain-relievers and anti-inflammatory medications may provide some relief. In advanced cases, surgery may be required to replace the joint. In the case of some smaller joints, a surgery may fuse the joint together in order to immobilize it. ongoing or recurrent manifestations of IA, with systemic symptoms and a severe impact to the claimant’s activities of daily living, social functioning, or cognitive functioning. This list is not complete. You should provide all evidence of how your arthritis limits your ability to perform work activity. If your Osteoarthritis or Rheumatoid Arthritis is so severe that you are no longer able to work for a living, you may very well be entitled to receive Long Term Disability benefits. Because of the complexities involved with proving that you are disabled by this disease, it would be in your best interest to consult with an experienced Long TermDisability Attorney. If your claim is not handled correctly, your appeal may never be approved while your bills continue to pile up. An experienced Long Term Disability lawyer knows how to obtain all of the proper documents and medical opinions to satisfy your burden of proof. Mr. Ortiz is an experienced LTD Attorney. He and his firm will work with you and with your medical team to maximize your benefits from the insurance company. Call 850-308-7833 for a free case evaluation if your claim has been delayed, denied or terminated.